The Federation University Australia Historical Collection, (formerly University of Ballarat), is held in the Geoffrey Blainey Research Centre (GBRC), and is located on the top floor of the E.J. Barker Library (Mt Helen Campus). The GBRC includes three special book collections of the library, the Geoffrey Blainey Mining Collection, the Federation University Australia Research Collection, and the Creedy Economics Collection. 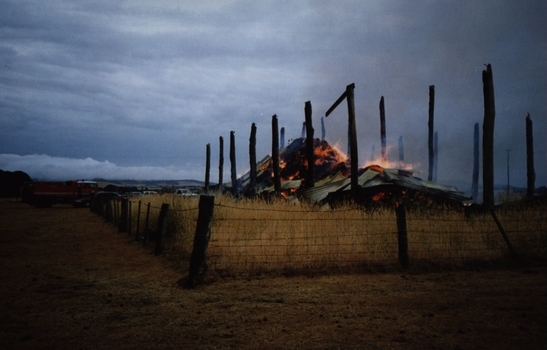 Titles from the three library special collections can be searched online via http://innopac.federation.edu.au, but must be read in the Geoffrey Blainey Research Centre Supervised Reading Room. 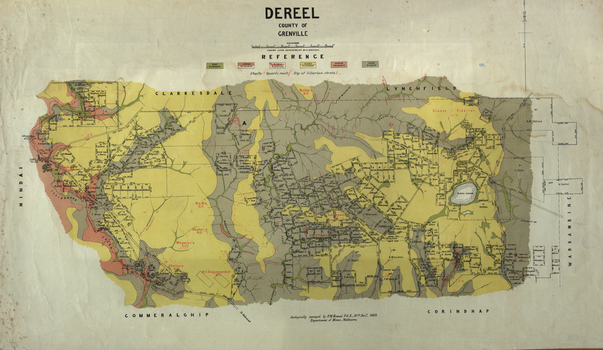 The Federation University Historical Collection is an extensive collection of historical material dating from the formation of the Ballarat School of Mines in 1869. The collection covers material from Federation University's predecessors including the Ballarat School of Mines, Ballarat Teachers' College, State College of Victoria, Ballarat; the Ballarat Institute of Advanced Education, Ballarat College of Advanced Education, Ballarat University College, Wimmera Institute of TAFE, Monash Gippsland, Gippsland Institute and University of Ballarat. 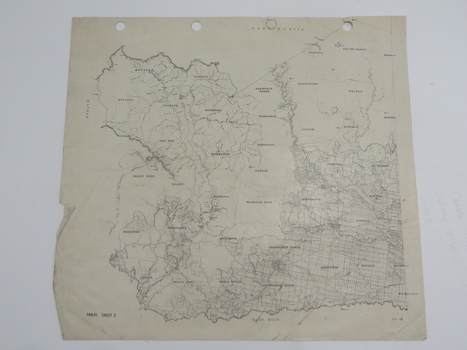 It is particularly strong in the themes of mining, education, and local history. On 01 January 2014 the University became Federation University Australia with the amalgamation of the University of Ballarat and Monash University’s Gippsland campus. FedUni brings together skills and expertise throughout Ballarat, Gippsland and the Western region of Victoria for the benefit of our regional communities. Federation University Post Office Gallery - The Post Office Gallery is committed to providing an outstanding educational resource and presenting an innovative exhibition programme, encouraging diverse audiences while creating strong links with the local and broader community. The Gallery's changing exhibition programme features works of art by FedUni's Arts Academy students and staff, local and emerging Australian artists and recent acquisitions from FedUni's extensive Art and Historical Permanent Collection. The vision is for the Post Office Gallery to be a vibrant, evolving centre for the creation and presentation of contemporary art. A unique learning and teaching facility, the Gallery provides the opportunity for mentoring of visual arts students in professional gallery and museum practice. The Federation University Historical Collection is located at the Geoffrey Blainey Research Centre (GBRC) on the top floor of the E.J. Barker Library (Mt Helen Campus) and includes a supervised reading room where collections can be accessed and read. 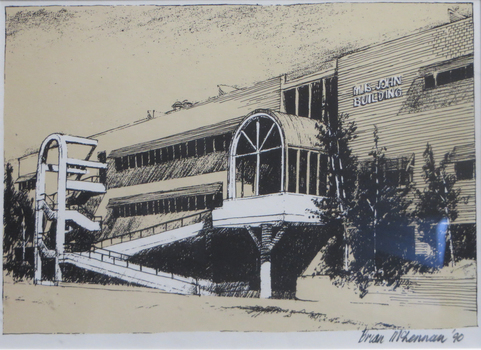 The GBRC also houses the Geoffrey Blainey Mining Collection and the Federation University Library Special Collections. 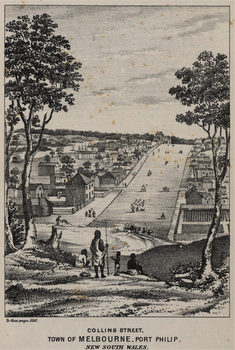 Titles from the Federation University Library collections can be searched online at http://innopac.federation.edu.au. The Federation University Historical Art Collection online catalogue is located at http://guerin.ballarat.edu.au/curator/collection/ and the Federation University Historical Collection is searchable via Victorian Collections. Federation University Historical Collection is an extensive collection of historical material dating from the opening of the Ballarat School of Mines in 1870. The collection covers material from the Federation University's predecessors including the Ballarat School of Mines, Ballarat Teachers' College, State College of Victoria, Ballarat; the Ballarat Institute of Advanced Education, Ballarat College of Advanced Education, Ballarat University College, Wimmera Institute of TAFE, Monash Gippsland and University of Ballarat. Federation University Historical Collection is significant because of its emphasis on local education, particularly at the tertiary level. It relates to the Ballarat School of Mines, Australia's first technical school, are an important aspect of the collection. Material on former staff, students and local identities are also housed in the collection. Through the Ballarat School of Mines Federation University is the third oldest tertiary institution in Australia, and has resulted in a strong and important emphasis on mining in the collection. Media release and newspaper articles relating to the establishment of the University of Ballarat. Ballarat University College is a predecessor institution of University of Ballarat. University of Ballarat is a predecessor institution of Federation University Australia. Puple card from Gordon Techncial College Geelong requesting the presence of Mr Fred. Martell at the annual demonstration in the Mechanics; Institute. 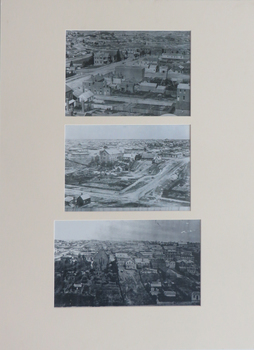 Three scanned images of black and white photographs showing Ballarat as viewed from the Ballarat Town Hall. .1- Ballarat towards the Ballarat Post Office and Black Hill 2. Along Sturt Street Ballarat 3. Along Sturt Street and Bridge Street Ballarat looking towards Mt Warrenheip. The original of this photo is in the Kicinski Family Private Collection. 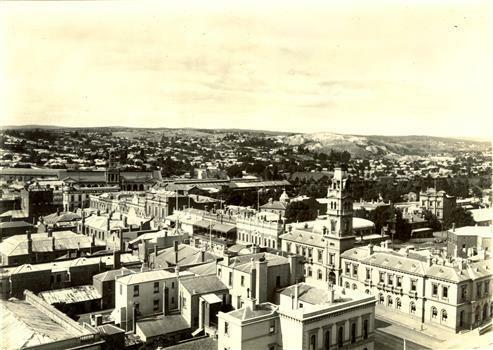 Their ancestor William Holstead was hall keeper at the Ballarat Town Hall, so it is though he took these photographs. 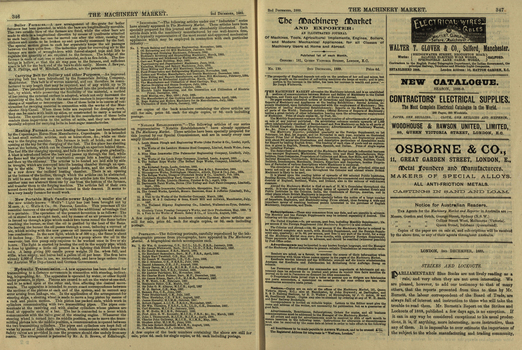 Yellow soft cover with black inscriptions and black images on front cover, 96 pages including advertisements. 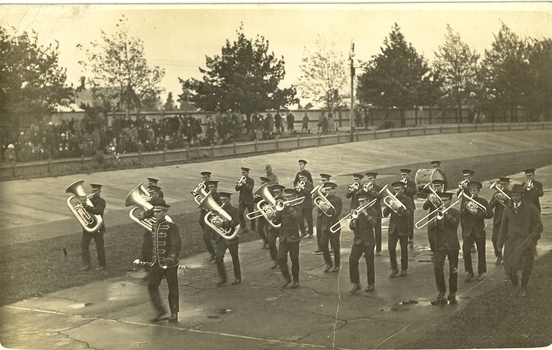 Black and white photograph postcard of a brass band marching and playing their instruments. The band is the City of Ballarat "A" Grade Band and the place is City Oval Ballarat. The occasion is the 1920 South Street Competition. The conductor is Percy Cole, Solo Cornet is Frank Wright, the Solo Trombone is Jack Shakles, the Solo Euphonium is Lary Sheehan, the Soprano is Harry Black and the Solo Horn is Lewis Thomas. 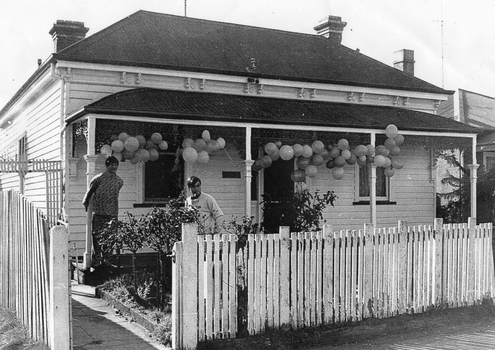 Frank Wright was a renown resident of Smeaton, where he was born in 1901. He lived at Laura Villa, and attended Smeaton State School. His father William was a gold miner and his mother's name was Sarah. Their family won many singing and instrumental awards. Frank was tutored by Percy Code and was awarded a gold medal for the highest marks in the ALCM examinations in the British Colonies at the age of seventeen years. He became the Australian Open Cornet Champion by the age of eighteen. A year later, Frank conducted the City of Ballarat Band, and later the Ballarat Soldiers’ Memorial Band. He formed the Frank Wright Frisco Band and Frank Wright and his Coliseum Orchestra. These bands won many South Street awards, and Frank as conductor won many awards in the Australian Band Championship contest. In 1933 Frank Wright sailed to England to conduct the famous St Hilda’s Band and was later appointed Musical Director of the London County Council, where he organized many amazing concerts in parks, in and around the London district. He was made Professor of Brass and Military Band Scoring and conducted at the Guildhall of Music and Drama. Frank was often invited to adjudicate Brass Band Championships around Europe, in Australia, including South Street and in New Zealand. The Frank Wright Medal at the Royal South Street competition is awarded to an individual recognized as making an outstanding contribution to brass music in Australia. Written in pen on the back - Information about who, what and where the band were playing. Also included were the pieces played. Seven foolscap pages of Principals comments on the proposed naming of the Ballarat School of Mines Tertiary Division to the Ballarat Institute of Advanced Education. 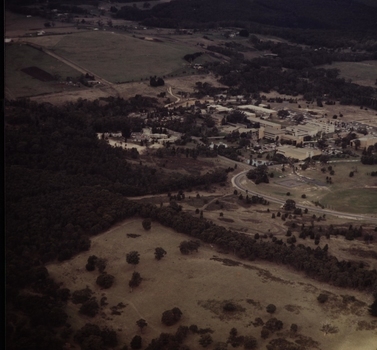 In 1973 the tertiary division of the Ballarat School of Mines was the Ballarat Institute of Advanced Education, which was situated on a new campus at Mt Helen which opened in 1970. Black and white photograph of male in glasses. Tie pin possibly a badge. Framed image of a drawing of the M.B. John Building Albert Street frontage. In 2017 the front arch stairs were demolished to make way for the repurposing of the building into the Ballarat Technical School. Black and White photograph of three men on a seat at a swimming pool. These images were used in a rolling slide show during the 2017 reunion of Ballarat Teachers' College 1967-1968. 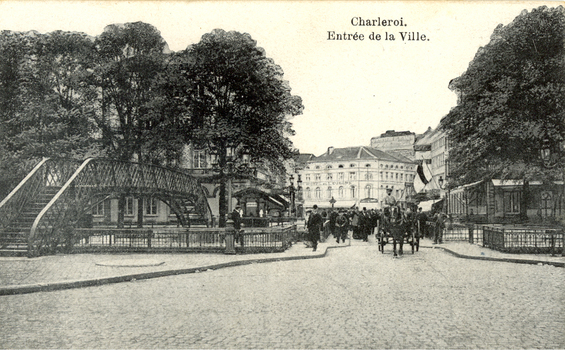 Black and white postcard depicting a cobbled street with horse drawn carriage and people gathered around a flag. Charleroi is a city and a municipality of Wallonia, located in the province of Hainaut, Belgium. Heavy fighting took place during World War I due to the city's strategic location on the Sambre. This postcard was most probably purchased during an australian soldier during World War One. Large brown book listing students in Alphabetical Order, and the subjects they have paid fees for. Three books relating to applications for students at the Ballarat Junior Technical School to transfer to other schools. Includes full name, birth date, date of admission, date of leaving, name of parent, address at the time of leving and reason for transfer. 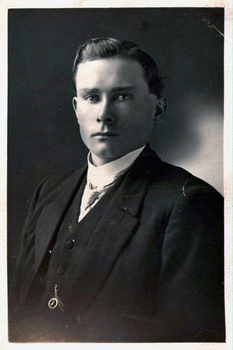 Postcard - black and white portrait of Horace Pickford. 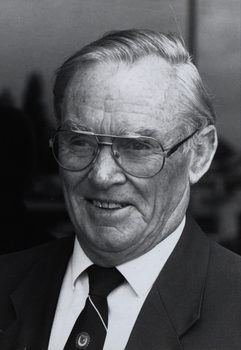 Horace Pickford was born at Clunes, Victoria. Private Horace Pickford (2882) enlisted for service during [[World War One]] at Melbourne. on 18 June 1915. 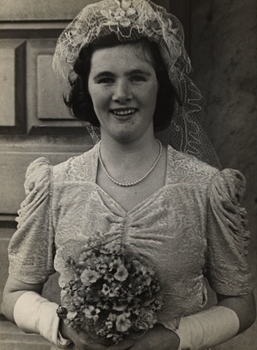 He gave his mother, Bessie Pickford of Yeovil Estate Clunes, as his next of kin. He served with the 57th Battalion until he was transferred to the 58th Battalion on 15 March 1916. He was appointed Lance Corporal on 01 December 1916, and was wounded in the back in France the next day and evacuated to England from Rouen. On 03 March 1917 Pickford was awarded the D.C.M. for conspicuous gallantry in action, and rejoined his unit in France on 09 July 1917. On 24 August 1917 Horace Pickford was promted to Corporal. He was killed in Action in France on 27 September 1917 and buried in the vicinity of Polygone Wood. The grave was later docuemnted at being located in the Tyne Cot. Military Cemetery (Plot 62, Row E. Grave2). This cemetery is in Passchendaele, 5 1'2 miles north east of Ypres. Horace Pickford married after enlistment, and his wife Mrs Sarah Ida Isabel (Ida) Pickford of 261 Malvern Road South Yarra became his next of kin. Written on back: "Lance Corporal Horace Pickford 2882 C Company 58th Battalion Aust Imp Forces On Active Service Abroad"
Nos 1-16 are group of samplers made from cotton lawn, cotton with sateen weave and flannel and made by Ruth McGannon. No 17 is a pair of gloves made by Margaret Russell. .1) A small square of yellow lawn with three horizontal rows in blue thread and three vertical rows in red thread of running stitch each 3.5 centimeters apart. The edges are frayed to 1.2 centimeters. .2) A larger rectangle of yellow lawn with three horizontal rows 7.8 centimeters apart and three vertical rows 10 centimeters apart of long stitch, stitched in blue thread. The edges are frayed to 2 centimeters. .3) A small square of yellow lawn with three horizontal rows and three vertical rows of blue thread of running stitch, each 1.9 centimeters apart. The edges are frayed to 1.5 centimeters. .4) A larger rectangle of yellow lawn with three horizontal rows 9 centimeters apart and three vertical rows 11.2 centimeters apart of running stitch, stitched in red thread. The edges are hemmed with two rows of long stitch .5 centimeter apart with a loose blue thread of laced running stitch weaving in and out of the red long stitch. .5) A rectangle of hemmed yellow lawn with a pocket formed at each end. Two rows of long stitch in red thread hem the edges with a blue thread stitched between each red stitch. The pockets are formed by turning back the edges and stitching them down in brown thread. R.M. is embroidered in brown chain stitch on the right side. .6) A rectangle of hemmed blue lawn the same as the previous piece but with five rows of back stitch in yellow and orange thread creating a pattern. .7) A rectangle of blue lawn with the top and bottom edges hemmed with two rows of long stitch close together in yellow and orange. The other two edge are frayed to 2.5 centimeters and has four rows of long stitch .7 centimeter apart in yellow and orange thread. .8) A blue lawn bag with two packets was made by hemming a rectangle of fabric on three sides in long stitch with orange thread, then yellow thread between the stitches. The fourth side is hemmed in hemming stitch in yellow thread with blanket stitch in yellow thread along the edge. This edge is folded up by one third to create a pocket. The edges on either side are stitched together. A row of chain stitch in orange thread is stitched down the middle to create two pockets. A tape is stitched to either side at the top and this is folded over the pocket. .9) A cream cotton with sateen weave rectangle is hemmed with a double row of orange thread in long stitch. On both sides is embroidery in orange and yellow thread. .10) A yellow cotton with sateen weave baby's bib is made from a rectangle of fabric with a semi circle cut out of the top. The edges are turned and hemmed with a narrower turning on the neck. A tape is stitched at either side of the neck. On the front is embroidered a train in blue and yellow threads. .11) A yellow lawn embroidery sampler using blue and brown thread shows long stitch, stem stitch, herringbone stitch, chain stitch, fly stitch, lazy daisy stitch, cross stitch and satin stitch. It is hemmed using drawn thread work and the bottom is scalloped and finished in blanket stitch. .12) A pink lawn embroidery sampler with green thread shows herringbone stitch, stem stitch, running stitch, chain stitch, cross stitch, lazy daisy stitch, fly stitch, feather stitch, satin stitch and back stitch. The bottom is scalloped and finished in buttonhole stitched. The other three edges are hemmed using drawn thread work. .13) A small cream flannel square with two smaller squares are stitched together down the middle in decreasing sizes using chain stitch. The largest piece is hemmed using both herringbone and a decorative blanket stitch. It also has a run and fell seam on the opposite side using both running and herringbone stitches. A row of feather stitch is on either side of the seam. The two smaller squares are frayed on the edges. .14) A cream rectangular flannel sampler has two seams along the length. One is a run and fell seam using running and herringbone stitches and the other is an open seam using running stitch and both edges are stitched down with herringbone stitch. The two shorter edges are bound and the longer edges have a tape which is stitched down to neaten the edges. On the right side are two rows of feather stitch. 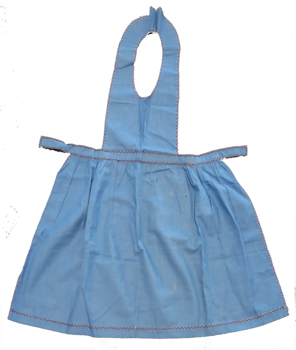 .15) This blue lawn apron has a rectangular gathered skirt which is attached to a waistband and in turn attached to a bib front which goes over the head. The bib and skirt sides are hemmed using decorative blanket stitch in pink and dark blue thread. The skirt hem and both sides of the waistband are stitched in two rows of herringbone in pink and dark blue thread. .16) This pale pink lawn child's shirt has french seam side seams, a waist band to which the shirt is attached using slight gathering. The sleeves have cuffs. There is a front facing and a collar and there is a small pocket in the left hand breast. .17) These yellow knitted gloves are made using plain stitch for the hand and rib for the wrist. These items were made as samplers either at school or most likely college. They are samples of embroidery stitches, seam types and sewing and knitting techniques. A box of flashcards as used by primary school teachers. 22 page booklet titles 'The Ballarat School of Mines: A Statement of the Objects and Resources of the School.' 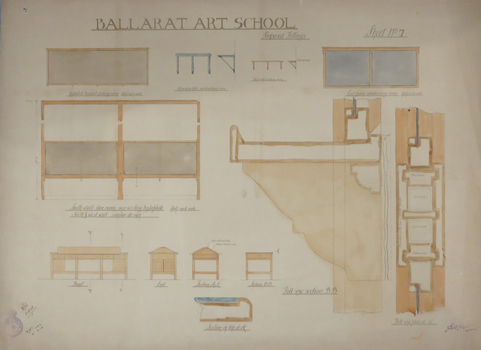 The book has a number of illustrations including the interior of the Ballarat School of Mines Laboratory, and the former Ballarat Circuit Court House. It includes a statement of the formation, progress, and present position of the School of Mines, Ballaarat. 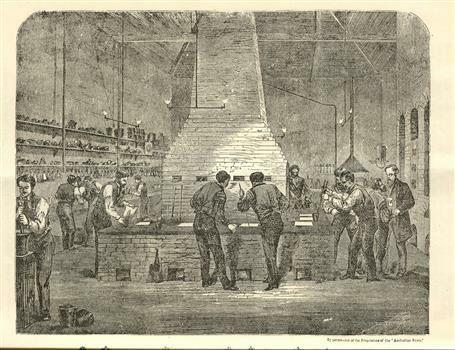 The image of the Ballarat School Mines Assay Room shows assay furnaces, crucibles, chimney, and teacher Joseph Flude on the far right. This room is now is a building known as the 'Old Chemistry Building'. Plan and elevation of the new Metallurgical Laboratory and Proposed Chemical Laboratory is depicted. The Ballarat School of Mines was the first School of Mines in Australia and was established in 1870. 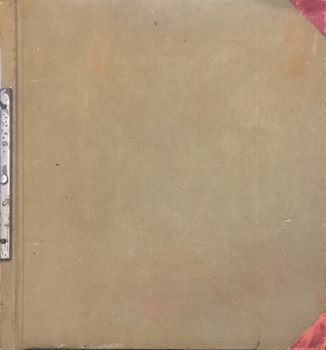 On front cover "Recorded in M-A" "1873"
Fire brigade in attendance at a fire on a property in Ascot. Possibly a shed at Launchley. Philip and Elizabeth Chatham standing at the gate. The University of Ballarat conducts courses in brewing and holds the Australian International Beer Awards. This trophy dates from an early incarnation of that award. Framed compilation of cartoons produced by Henri Moritz in 1982 as a fundraiser for the Ballarat Amateur Radio Group. Pale blue covered 74 page booklet relating to the Ballarat School of Mines in the year 1908-9.